Join us from 3p-6p at Thelma’s Place for a party to kick off their 65 hour crow-funding event! Together, with Home Instead Senior Care, Thelma’s Place is raising money for their non-profit day-center, which provides much needed services to seniors with cognitive disabilities, while offering their caregivers a much needed respite break. All are invited to join us for food, drink, entertainment, silent auction items, and MORE! You do not have to make a donation to join, this is an open-house for anyone who wants to come and checkout the beautiful center. However, the Home Instead Senior Care Foundation will contribute matching grants to those non-profits which raise the most money during the 65 hour event. With the help of the community we can help raise funds that will provide services to those who are limited by financial restrictions. 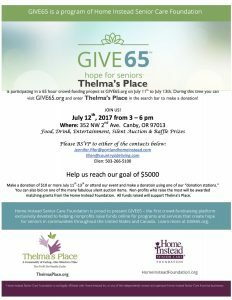 You can donate without attending the event by going to give65.org, clicking on “donate,” then searching for Thelma’s Place. There you can read about the mission, view pictures and make a donation! Please contact Ellen Coburn for more information – Ellen@countrysideliving.com or (503) 266-5100.